A St. Augustine physical therapist has dedicated most of her career to helping those with Parkinson’s disease. Her passion inspired more than 15 area businesses and dozens of volunteers to join the cause, helping to raise over $52,000. Every nine minutes an American is diagnosed with Parkinson’s disease (PD). There are an estimated 1 million Americans living with Parkinson’s disease and more than 10 million people worldwide, according to the Parkinson’s Foundation. “Parkinson’s disease is a progressive, neuro-degenerative disease that depletes the brain of certain neuro-chemicals including dopamine. Low levels of dopamine cause both motor and non-motor symptoms in people with the disease,” said Dr. Melanie Lomaglio, a physical therapist in St. Augustine. Lomaglio is co-owner of St. Augustine Rehabilitation Specialists (STARS Rehab) and a graduate of the University of St. Augustine for Health Sciences where she also served as a faculty member for 12 years. She has coordinated the St. Augustine Parkinson’s Support Group for over 10 years and works exclusively with patients who have Parkinson’s disease. When Lomaglio heard that the Parkinson’s Foundation was planning Moving Day, a fundraising event in Jacksonville, she jumped at the volunteer opportunity to help plan the inaugural event. “Moving Day Jacksonville is a fun and inspiring fundraising event that unites the community in the fight against Parkinson’s. Since 2011, Moving Day events across the country have raised more than $17 million to improve care and advance research toward a cure,” said Celeste Tennant, community development manager for the foundation. First, Lomaglio and the STARS Rehab team raised over $2,400 for the event through a community-supported raffle. Fifteen locally owned businesses and restaurants, such as the St. Augustine Distillery and the Kookaburra, donated gift cards, and STARS Rehab sold raffle tickets to raise the funds. “Moving Day is more than just a walk. It is a celebration of movement featuring a special Movement Pavilion with yoga, dance, Tai Chi, boxing, PWR, and other activities—all proven forms of exercise to help manage Parkinson’s symptoms,” Lomaglio said. She was asked to emcee the November 10th event and took charge of organizing the exercise demonstrations. Lomaglio is trained in PWR, Parkinson’s Wellness and Recovery, which is a targeted exercise program to address posture, weight shifting, trunk rotation and balance. In addition, she runs a non-contact therapeutic boxing program in St. Augustine that focus on agility, balance, and learning new motor tasks; both programs were demonstrated at the Moving Day event, which raised more than $52,000, according to event organizers. “Funds raised through Moving Day support the Parkinson’s Foundation national mission by delivering expert care to more than 100,000 people living with Parkinson’s; funding cutting-edge research to advance toward a cure; providing free resources for people living with Parkinson’s and their families,” Tennant said. In addition to raising money, Lomaglio inspired a group of students from the University of St. Augustine for Health Sciences to volunteer at the event. Most of them were students in the Doctor of Physical Therapy program. “We had 25 students from the University of St. Augustine for Health Sciences who came to volunteer and give back to the community. They helped with logistical tasks like set-up and clean-up, as well as providing information about the resources available through the Parkinson’s Foundation,” Lomaglio said. “Most of our volunteers are students from University of St. Augustine for Health Sciences as well as the University of North Florida. We couldn’t do this without our volunteers, who are very, very important, so thank you to all the students who are here today,” said Crista Ellis, community relations manager for the Parkinson’s Foundation. For University of St. Augustine for Health Sciences student DeAnn Taylor, volunteering at Moving Day was personal. “My grandfather lived with Parkinson’s and he passed away in 2014, so I’m walking in memory of him. Parkinson’s has become one of my passions because I saw how physical therapists helped him. He was able to walk until he died. So I’m here supporting the Parkinson’s community because I want to make an impact just like those physical therapists did for him,” she said. “I firmly believe we have to shift the way we treat people with Parkinson’s by starting right away after diagnosis. It’s much harder to make a change once a person is falling or having trouble moving as the disease progresses,” Lomaglio said. “We need to start educating patients at the moment of diagnosis, do a full balance and gait assessment and then have them come in for serial evaluations every six months. If the person is doing great, we progress their targeted exercise program, recommend wellness, and schedule a six month follow up. However, if we identify a problem then we’ll begin one-on-one care” she added. Lomaglio said the most important thing for Parkinson’s patients is never stop exercising; exercise is medicine for people with Parkinson’s, and research has shown it to be just as effective as medication itself. “To maximize outcomes, a person with Parkinson’s needs both medical management and movements. In between therapy you need ongoing wellness, so we developed a program that includes non-contact boxing because it is great for training agility, balance, and the brain. Learning a new motor skill helps with neuroplasticity to slow disease progression. It’s also a physical way to vent frustration and it’s fun. There is a lot of comradery among the boxing participants as they get to know each other, and it’s a way for people to keep track of each other, a strong motivation for them to keep exercising. Having that social connection through wellness and support programs is critical,” she said. Jerry Boling of St. Augustine, was diagnosed six years ago with essential tremor, but as new symptoms emerged his diagnosis changed to Parkinson’s disease in 2016. He still works as a real estate agent and he knows how important it is to keep moving. 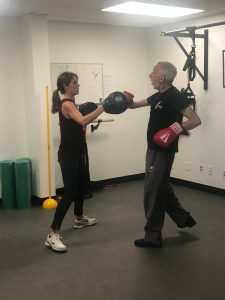 He participates in Lomaglio’s boxing program at STARS Rehab and said that the comradery and challenging exercise is a perfect combination to help combat both his motor and non-motor symptoms. Most people who develop the symptoms of Parkinson’s disease do so sometime after the age of 50, but Parkinson’s disease can affect younger people as well. Approximately 10% of Parkinson’s diagnoses occur before age 50—these diagnoses are called Early Onset (or Young Onset) Parkinson’s disease. The cause of Parkinson’s disease is still unknown, although there is some evidence for the role of genetics, environmental factors, or a combination of both. It is also possible that there may be more than one cause of the disease. Scientists generally believe that both genetics and environment interact to cause Parkinson’s disease in most people who have it. Currently, there is an enormous amount of research directed at producing more answers about what causes Parkinson’s disease and how it might be prevented or cured. When physicians diagnose Parkinson’s, they often describe it as idiopathic (ID-ee-oh-PATH-ik). This simply means that the cause of the disease is not known. For more information about the Parkinson’s Foundation or to make a donation, visit www.parkinsons.org.